Very nice and convenient, well equipped room, and free coffee is a nice touch. Thanks a lot! Efficient, good online booking experience, friendly reception and restaurant staff. Really REALLY like the default no air-conditioning and opening windows. Like the free wi-fi as well, no problems around it, all worked beautifully. Incredibly convenient near Southern Cross Station, across the road from the Melbourne Hub. On tram line. Outstanding attention to detail as an eco-friendly hotel. Great little lounge for reading, library with books to swap or just take or leave. Great free coffee machine. Adequate, healthy continental breakfast. A great experience as usual. Looking forward to another stay in June with eggs benedict for breakfast. Told our brother and sister-in-law about the Alto Hotel and they will be joining us in June. Absolutely a pleasure to stay at Alto. Would definitely recommend to friends and family and would stay again next time I'm in Melbourne! I love the green/environmental aspects you guys have developed as part of the hotel. Great stuff! Very pleasant stay, great breakfast and coffee, rooms quite small and no natural light. Very good location. Loved Bourke street. We enjoyed our stay at Alto, and I was pleased with how quiet the room was in spite of being in the city. We were comfortable, and our 3-year-old son enjoyed the hot chocolate drink available in the lounge almost everyday we were there. All the staff we encountered (front desk, cleaning staff, food staff) were great. It is more expensive than other hotels, but we liked supporting a green hotel. Keep it up! Comfortable and quiet room; helpful and pleasant staff at reception and in breakfast room ; umbrella in room very useful as it was raining that night and following morning; charming building. 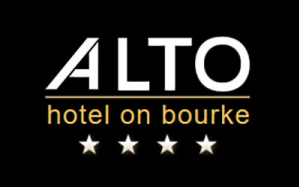 We very much enjoyed our stay at the Alto. The staff were all very helpful and courteous, while the room was very pleasant and spotless. Thank-you, we intend to stay again. We enjoyed our stay at the Alto. The room suited our family size - not very spacious but quite cozy. The location was also conveinent. The complimentary coffee was great. Although we didn't get time to use the other facilities offered a the hotel (relaxation and the gym). It was our first time but we hope to be back again. Thank you. Always happy to stay there, like the atmosphere and convenience. Once again a great stay at Alto. Am looking forward to booking my next trip, thinks once again Alto. Very happy with the room, parking was easy to organise and well located, great service. Very nice and clean, great to be able to use stairs instead of lift. Staff were very helpful and friendly. Also loved the relaxation room. Polite & helpful staff, great room & facilities.